$89.99 Car'n Truck COLLECTION Vehicle Outlines all on 1 DvD box set, DvD contains 2008-2014 vehicles all others are on the web site. Retails for $199.99 Collection of over 70,000 VEHICLE OUTLINES & TEMPLATES + MORE!!! NOW WITH FREE WEB UPDATES for 365 days! You Must Register your software within 7 days of payment. This will allow you to get any new vehicles added when they comes out. The Manufacture NOW states this software can be used for vehicle wrap design also! DON'T BE FOOLED BY OTHERS selling ILLEGAL BOOT-LEG, BURNED or USED COPPIES! C&C Signs and Banners Only sells BRAND NEW ORIGINAL, and sells them for less then anyone! We offer the one and only BRAND NEW, Not Used, 1 DvD set, in it's orginal factory case. We have sold 1000's like these to many happy SIGN MAKERS over the last 10 years on eBay. THIS IS NOT USED or A COPY! THIS IS THE ONE and ONLY Original (1) DvD set Just Out from the Factory, BRAND NEW, NEVER USED! Why pay as high as $399.00 for other programs like this when you can have this one for less!!! CnCsigns com ships w/in 48 hours of cleared payments!!! - MORE than 70,000+ images some with up to 5 accurate scaled views. - INCLUDES the top views on most outlines, not all. - PERFECT for vehicle lettering and some wraps. - CARS, SUVs, PICKUPS, VANS, BUSES and much, MUCH MORE!!! '08-'14 Car and Truck Vehicle Outline Design Collection / Professional Outlines / Vehicle Wrap Design System, It�s been updated with lots of the hot new vehicles. With nearly 7000 more templates than last year. WHY BUY LAST YEARS or even a much older version, WHEN YOU CAN HAVE THE NEWEST from CnCsigns com! NOW most templets have up to 5 views of each OUTLINE. Please NOTE*** This program covers a lot of vehicles but it is not complete, it is impossible for anyone to have every vehicle, and every detail for every manfacture, make & model offered in the world if you feel this in not right please pass on buying. This library contains most of what you need for the design and production of scaled vehicle lettering and striping. The front, rear, side and top views allow you to create vehicle graphics much easier, faster and more accurately then ever before. 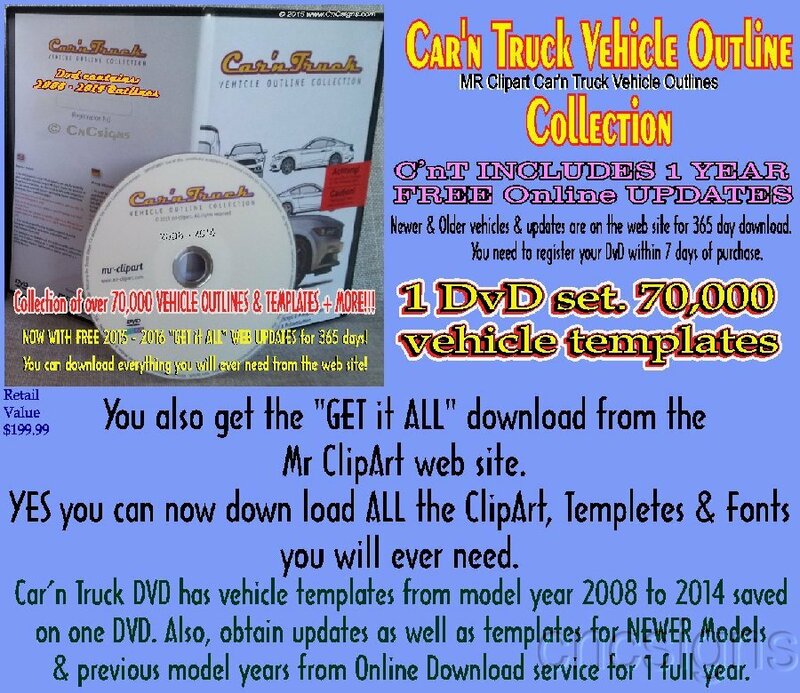 This (1) DvD set has vehicles from 2008 - 2014, that is most of all the vehicles you will need, BUT if you do need older vehicles Model years starting with some as far back as 1992 in 4 views CAR & TRUCK Collection has them on the web site for downlad for 365 days. (You need to Register your software within 7 days of purchase) Files are a hybrid (1) DvD set that works with most Windows PC and Macintosh computers. Templates are saved in an Adobe Illustrator (.AI), Acrobat(.PDF), Photoshop(.PSD) & iPad (.SVG) format that imports flawless into CorelDRAW and many popular sign making programs. Why BUY a "PIRATE "CD or DVD" that my not even work, WHEN YOU CAN HAVE THE ORIGINAL DvDs!!! Design comfortably with the 1:20 scale vehicle templates it takes just a few seconds to design professional vehicle lettering graphics. The templates contain most of the important details, like door handles, fuel cabs, rails and much more details, NOTE*** trademark badges are not shown. NOTE*** The drawings of the vehicle templates are as exact and detailed as possible. NO WAY are we able to guarantee a 100% exactness of the dimensions at all. The views of the vehicles are 2-dimensional drawings of convex areas like fenders, the depth of mouldings and the curvature of a windshield, for this reason we strongly recommend to hand measure the vehicle before you starting cutting vinyl, this could avoid spend time, stress and expensive material loss. You can start right away with the design. With this Car'n Truck Vehicle Outline Collection you are able to produce to-scale presentations and designs of vehicle letterings and graphics. The templates can be colored and modified in virtually all major DTP, Graphics and Signmaking programs. All images on the DvDs are saved in Adobe Illustrator AI format and compatible with SignLab, Pro Cut, Corel Draw, Adobe Illustrator, Vinyl Express Lxi, FlexiSign & Pro and Graphix Advantage and more. For PC/Windows or Mac OS The DvDs of the Car'n Truck Collection are hybrid DvDs, that means they run on MS-DOS/Windows and on Apple Macintosh - computers. It is not necessary to install or unpack the vehicle templates. No need for bulky Books, Manuel and instructions are right on the DvDs, no paperwork comes w/the DvDs everything you need is right on the DvDs, the product comes w/ a sealed sticker to insure it's FACTORY NEW and in MINT CONDITION and not been opened once it has left our hands. All your vehicles and everything you need to know is listed right on the DvDs. Best of all this program is in many languages. Just open, merge or import the files from the DvDs right into your graphic or signmaking application. THIS IS NOT A COPY! This IS THE ORIGINAL (1) DvD set IN MINT CONDITION, Brand NEW, Never Used! It should be compatible with most all sign-making and graphics programs such as CorelDraw, Adobe Illustrator, Adobe Photoshop, Freehand, QuarkXPress, PageMaker, Fireworks, Adobe Illustrator AI format and compatible with SignLab, Pro Cut, Corel Draw, Adobe Illustrator, Vinyl Express Lxi, FlexiSign and many others. Just make sure your program can import or merge Adobe Illustrator (.AI), Acrobat(.PDF), Photoshop(.PSD) & iPad (.SVG) files. For More info about "Mr-Clipart VEHICLE OUTLINES" CLICK HERE! Why use Car'n Truck - Mr Clipart - Templates? Extensive range of commercial vehicles! Mr-Clipart carries over 90% of all the commercial model vehicles stretching back 16 years. For example, suppose there are sixteen versions of a particular van, then Mr-Clipart should have all sixteen versions. As well, Mr-Clipart has non-standard commercial vehicles such as trailers, utility boxes, truck caps, fire trucks, ambulances, buses and much, much more. Type of vehicle templates! The combination of an extensive North American as well as European and Asian collection ensures that all customers have all the vehicles they need at their immediate disposal. Accuracy! Mr ClipArt generally devotes between four and six hours to construct one single vehicle template! That may seem excessive, but not when you expect to see incredible levels of accuracy in just one of Mr-Clipart templates. And Mr-Clipart has 23 years of authentic experience in making the best templates for vehicle graphics and wraps. Unlimited upgrade templates! For 365 days from the day of registered purchase you will have unlimited access to all existing and upcoming vehicle templates on our the web site for the year. Besides the new templates you also have access to the vehicle drawings saved in a couple of different file formats, some of those formats are already saved in 1/1 scale. Custom digitization services! If you need something that�s not listed, then Mr CLIP ART will do the best to find it for you at no extra charge! Mr-Cliparts ability to do so depends on whether Mr-Clipart can find an example of the actual vehicle, whether you can send a useful drawing or picture, and Mr-Clipart relative workload at the time. Mr-Clipart will always do their best to accommodate you. CLICK HERE: JUST to be sure you'll be happy we are allowing you to down load what is on the program before BUYING, "CLICK HERE" to Download. Complete list of the cars and trucks included in the Mr-Clipart Car'n Truck Collection web site. USA BUYER to pay $7.50 Priority Mail S&H&Ins. 1st item, $3.70 S&H ea. item (most items check ad) thereafter shipped to the USA. PLEASE, if you do not agree w/ the listed S&H & INS. cost, PLEASE, PLEASE do not purchase this item. This shipping method & cost is the only way we can ship this item and be covered buy eBays & PayPal's overseas rules, and be sure that the item arrives in your hands. ***ALSO NOTE*** if the wrong S&H amount is sent your payment will be returned and your order will be delayed untill the correct amout is paid. N.J. law requires US to collect current sales tax for any deliveries made within the state of N.J. ** NOTE ** BY CLICKING to BUY THIS ITEM YOU HAVE READ & AGREED TO ALL OUR RULES! It's simple, please do not purchase if you do not agree w/ all our rules. Thanks and Good Luck from: CnCsigns.com@Gmail.com For more information about "US", or "HOW TO PAY", or "WHERE TO PAY", CLICK ON: C&C Signs "FAQ"
Since this item is software there can not be "ANY" returns on DvDs to US! Any defect problems w/ the software must go to the Manufacture, Postage Paid by the customer. All sales are final! Please do not purchase if you do not agree with ANY or ALL of OUR RULES! Please keep in mind that this software is only to HELP you design your lettering or graphics for these vehicles. And as stated in the ad, this software has MOST of the vehicles you need, but may not have ALL, that is why we allow you to down load the FULL list of vehicles before you buy it, if the vehicle you need is not listed, you will need to contact the manufacture to complain, you can email or call Mr-Clipart and they will help you, we do not manufacture this program nor are we Tech support for it, we just resell it for the manufacture. Also as stated right from the manufacture: The drawings of the vehicle templates are as exact and detailed as possible we are not able to guarantee a 100% exactness of the dimensions at all. The views of the vehicles are 2-dimensional drawings, of convex areas like fenders, the depth of moldings and the curvature of a windshield. For this reason we strongly recommend to hand measure the vehicle before you start cutting your vinyl. This could avoid spend time, stress and expensive material. But the manufacture does state it can still be used for vehicle wrap design. SEE OUR OTHER AUCTIONS FOR MORE GREAT SIGNS, VINYL & other ITEMS!!! CnCsigns only takes Visa, MasterCard, Discover, or American Express THRU PAYPAL.com ONLY!! !